Six architecture students have created a temporary fashion store in Budapest with a billowed canvas canopy and a sliced firewood floor. Daniel Balo, Zsofi Dobos, Dora Medveczky, Judit Emese Konopas and Noemi Varga hoisted 250 square metres of fabric into place around the walls and ceiling of the shop for clothing brand Nanushka. The firewood circles cover the whole floor of the store, while more sticks are fastened together to provide stands for accessories. 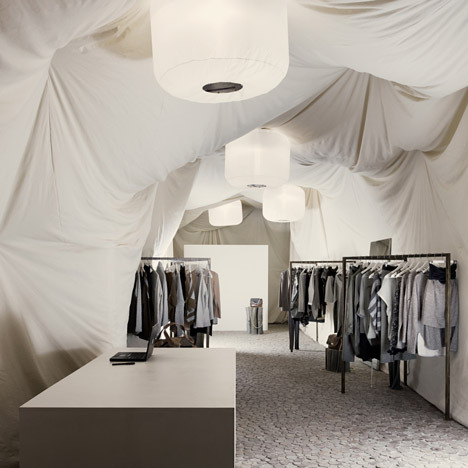 Inflatable lights by Hungarian manufacturer Ballon are attached to the fabric ceiling and garments hang from rusted steel racks. Other popular fabric interiors we've featured include a hostel where guest sleep in fabric pods and a shop with hosiery stretched across the walls - see all the stories here. Photography is by Tamas Bujnovszky. Located in the heart of Budapest and created for the 2011 autumn / winter season, the new Nanushka retail space aims to emphasis the brand's core values and contrast the sometimes overwhelming racket of the urban experience. The young Hungarian fashion designer Sandra Sandor handpicked a team of enthusiastic graduates after posting an ad in several design schools. The selected architecture students, namely Daniel Balo, Zsofia Dobos, Dora Medveczky, Judit Emese Konopas and Noemi Varga, arrived to the team from separate universities and different classes. Working together for the first time, they had no more than three short weeks to finish the project. Quick and creative solutions had to be found to complete the task within the short deadline. However, they faced other constraints: they had to come up with a design that would leave the interior unharmed (only minor drilling was permitted) and also had to work with a relatively low budget. Also, the retail space in question had an unusually elongated shape. These were the circumstances under which they would attempt to create a natural, warm interior that would be in harmony with the values of the Nanushka brand. As inspiration for their design they used the wilderness and elements from classical wedding tents and barn weddings. Accordingly, they gathered together raw materials such as cotton, linen, firewood and rusted steel for the design. First they created a rigging system for the 250 square meter canvas that would drape the interior by pulling cable wires below the ceiling. Running from front to back they were able to hoist the canvas into the air and let it fall and flow in a way that basically wrapped the entire retail space from the inside. They then sliced firewood into little circles and laid them out to create flooring. Small display stands were built from logs of wood that sprouted from the ground. Linen poufs and Ballon Lamps sharing the same cylinder shape strengthened the organic flow of the space, while the strict, geometric forms of the counter and fitting rooms, as well as the rusted steel racks created a firm counterpoint and a calm balance. Contrasts were also created with the choice of materials through the combination of rusty, rough, smooth and soft surfaces, all soothing variations of tranquil, clean, quiet white. The use of these elements and materials was highly eco-friendly as their recycling was actually the basis of the entire design concept. Construction: Tamas Lindwurm - Honti Kft.